Tekashi69 - Bio, Age, Daughter, Height, Net Worth, Ethnicity, Is He Gay? Home Musicians Tekashi69 – Bio, Age, Daughter, Height, Net Worth, Ethnicity, Is He Gay? Tekashi69 – Bio, Age, Daughter, Height, Net Worth, Ethnicity, Is He Gay? Daniel Hernandez popularly known by his stage name Tekashi69 is an American rapper and songwriter, best known for his song titled Gummo. The young rapper became an internet sensation in July 2017 following his eccentric appearance, having a rainbow dyed hair as well as multiple versions of the No 69 tattooed all over his body. He has won the hearts of his many fans with his unique style of rap which has deviations from the normal hip-hop norms. Learn more about his bio, age, ethnicity, daughter, net worth, height and other interesting facts below. Daniel Hernandez was born in Brunswick, Brooklyn to a Puerto Rican father and a Mexican mother. He belongs to mixed ethnicity and holds American nationality. While he was growing up, Hernandez developed a keen interest in rap music right from a very tender age and that made him pay less attention to his education. He was reportedly expelled from school when he was in 8th grade and he never went back to complete his education. The youngster rather experienced a rough time in 2009, following the death of his father. At the time, he was just thirteen years old; Daniel did several jobs and at some point got involved in selling illegal drugs in order to help out his mother financially. The young rapper adopted the stage name Tekashi69 with which he released his first rap song in 2014. His first songs were produced by a Slovakia-based record label called FCK THEM, after which he followed it up with multiple tracks and music videos including Hellsing Station, Yokai, and Scumlife. In 2017, alongside Trippie Redd, Hernandez released the song titled Poles1469 which recorded significant views on YouTube. 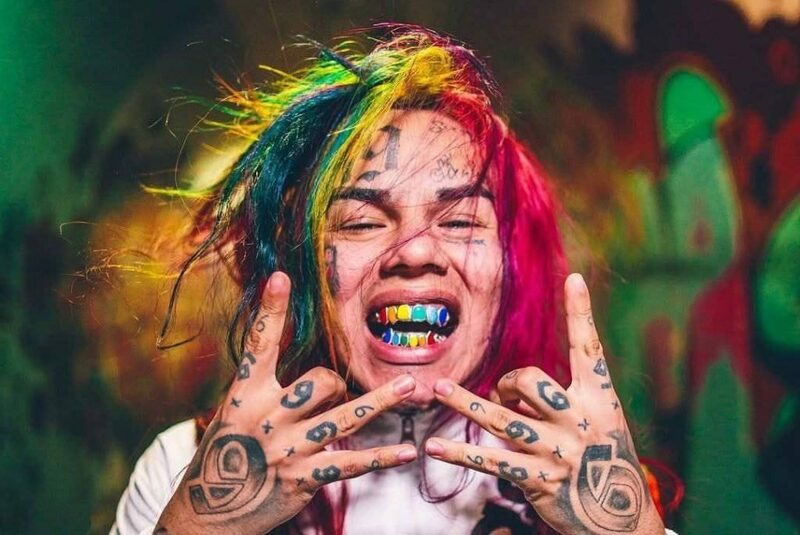 Tekashi69 changed his looks in 2017, coming out with a rainbow dyed platinum hair as well as having the multiple versions of the number 69 tattooed all over his body. With his new look, Tekashi’s first picture on Instagram, Twitter, and Reddit went viral, thus bringing the youngster to the limelight. He further pulled another stint by releasing his debut single titled Gummo in November 2017. The song reached No 12 on the Billboard Hot 100 chart and also raves reviews worldwide. Furthermore, Hernandez next single title Kooda was released in December 2017 and it peaked 61 on the Billboard Hot 100. The following year, alongside Fetty Wap and A Boogie with da Hoodie, Hernandez launched his third single titled Keke. Later in the same year, he released his debut mixtape titled Day69. The album recorded commercial success, reaching No 4 on the Billboard 200 with millions of streaming on SoundCloud. Net Worth: How Much is Tekashi69 Worth? Tekashi69 currently has a net worth of $1 million. He has been outstanding since the inception of his career and is currently living a decent lifestyle. The rapper has collaborated with several rappers and has amassed a lot of wealth through his music career. He previously shared on his Instagram that he had signed a $7.5 million deal with Illuminati and later on; he also revealed he signed a $4.9 million endorsement deal with a headphone company. However, the authenticity of these facts cannot be ascertained. Wondering if the young rapper is gay or not? Well, there are so many gay celebrities out there and Tekashi69 won’t certainly be the last of them all. The internet has been abuzz with regards to Tekashi’s sexuality. There are several rumors and controversies from the part of his fans pointing to him being gay. Although the rapper has been portraying himself as a homosexual gangster in the hip-hop industry, he was able to put off the rumors. Tekashi69 said he loves gay people; he is not homophobic and that doesn’t mean he is gay. He further made some clarifications through his latest song titled Kooda, where he insisted he is not gay. Additionally, if you are looking for more clarifications, then his daughter would certainly do justice to that. Apparently, Tekashi69 has straight sexual orientation and he is not gay. Tekashi69 has always kept information regarding his personal life under the shades. He has a daughter from his past relationship. However, there is no much information regarding his baby mama as well as his daughter. In March 2018, the young rapper featured his little princess on his Instagram on the occasion of her birthday. He was blasted by his daughter’s grandmother who said he is not a doting father like he claims to be. Regardless of all the controversies and sexual assault charges surrounding the young rapper, he is trying all possible best to make as much money as he can in order to give his daughter a better future. Tekashi69 is currently single and not yet married. The amazing rapper is very handsome and has an attractive personality. He is of an average height, standing at 5 feet 6 inches with a masculine bodybuild. He has incredible body measurements and colored dreadlocks. His weight and body measurements are currently not available. Additionally, Tekashi69 has the number 69 and other write-ups tattooed all over his body. The fast-rising star is very much active on social media and you can connect with him on Instagram and Twitter.